Coming from a design background I’m comfortable with the process of iterations – you can’t wait for a product to be 100% perfect before it is released and often consistent tweaks are required after a project is live or product hits the shelves. the repetition of a process or utterance. repetition of a mathematical or computational procedure applied to the result of a previous application, typically as a means of obtaining successively closer approximations to the solution of a problem. a new version of a piece of computer hardware or software. I was chatting with my BT mentor on Friday explaining my evolving method of planning lessons and then scribbling over the plan in red pen with what did actually happen, this visible act supporting my reflection process. It dawned on me that in teaching you are iterating as you go. You have the concept (achievement objectives) and shape an outcome (lesson/unit plan) then you release the product (lesson) interacting with it in real time as it unfolds (teaching/learning), then debug things on the fly as users interact and tweaking the user experience from feedback (formative assessment). I can see an awesome flow chart shaping up for this! As a BT I often feel like there is not enough time for planning and crafting amazing lessons, a feeling echoed by friends also new to the real world of teaching. However with this idea of iterating my classroom I suddenly feel like my need to have things completely planned out has lifted and my focus is now on the process of being in the moment with my students, side by side to shift and move with them as they grapple a new concept or try a new way of manipulating materials. Its not the plan that is the success or fail but how I’m supporting students in real time – a focus on the user. So, rather than aiming for the perfect lesson plan my aim is to iterate, to create new versions as a result of previous applications. To embrace epic planning failures in favour of the beneficial user (student) insights they create. As a fellow BT, this resonates so strongly! 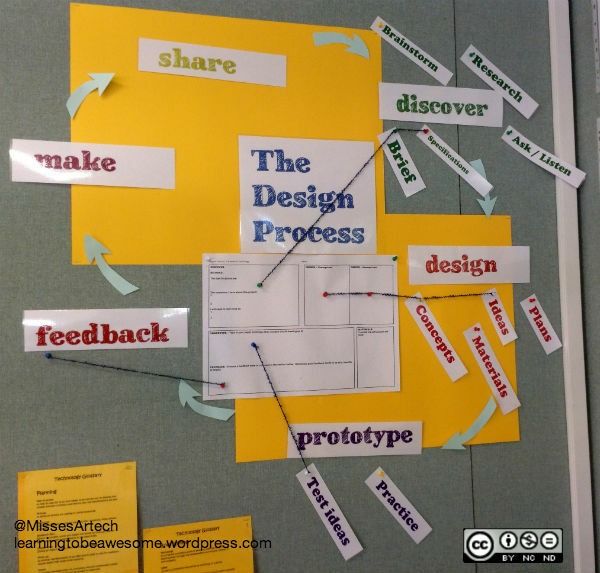 I love your design process display – as I unpack design thinking a bit more I’m hoping to unpack this into “English language” and find space for it on my walls. Maybe even a hallway display? Awesome concepts. Hey Kimberley, I am enjoying reading your journey. I am enjoying seeing our teachers making digital notes on their Google Doc planning. What a great wall display and even better that you are sharing it on your 5th wall. All the best.